Size of this PNG preview of this SVG file: 800 × 400 pixels. Other resolutions: 320 × 160 pixels | 640 × 320 pixels | 1,024 × 512 pixels | 1,280 × 640 pixels | 900 × 450 pixels. This flag was created with an unknown SVG tool. 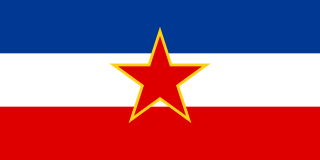 current 17:07, 1 March 2019 900 × 450 (381 bytes) FDRMRZUSA Corrected centering and proportions imperfections for "red star". Optimized svg code. No other changes.